We are happy to announce our new approved project “SEV 4×4” ! If you are from Italy, Malta or France, than you should definitely take a look at this! All the 4 rounds are similarly structured! The main objective of the SEV4x4 project is to develop learning competences for 16 volunteers from Malta, Italy and France and to help them in their employability in the future. Teambuilding, activities of non-formal education – that they would pass-on to others or implement in their own activities in Baia Mare. Face painting / Origami / Balloon Twisting – to get some specific working skills with children. Meetings with coordinators from orphanages, hospital and social centers to learn tips and tricks in working with these categories of youngsters. In teams, the volunteers will work with children and teenagers from orphanages around town. They will provide the orphans with alternative free time opportunities acting as an example to them and providing the motivation they need to develop themselves as responsible grown-ups. The volunteers will work also with children from the pediatric department of the municipal hospital, by doing animation to brighten up their day and (hopefully) ease their recovery process. Also, the volunteers will work in Social Centers in town, implementing activities with youngsters suffering from various disabilities, doing physical therapy, animation, music or just simply assisting them in normal learning tasks. That’s not all, the volunteers will be provided with once per week Romanian Lessons and English Conversation Lessons, that will make their stay in Baia Mare easier. During their stage ,they will have to create testimonials and blog entries about their experience, that will be published on the association’s website and also, in the last month, to create a booklet with methods they used in the work so far. They will have the support of the staff of T4UTH, the local volunteers, their assigned mentor and the coordinators from the partner associations. Volunteer that is unemployed, either coming from a migrant family or is part of an ethnical or geographical minority. Citizen (or resident) of Malta, Italy or France. Between 18 – 30 years old. Able to follow a weekly working schedule. Able to work with children and youngster (or to have willingness to learn to). Flexible to changes, responsible, does not discriminate, is open minded! The volunteers that are selected will have the chance to participate in other activities organised by T4UTH, such as intercultural evenings, cultural events, temporary sport events, outings and workshops. The organisation shall provide financial support to the participant for undertaking a mobility activity for the European Voluntary Service (called hereafter the “EVS”) under the Erasmus+ Programme. The participant shall receive a financial support from EU funds for 122 days. The total amount for the mobility period shall be determined by multiplying the number of days of the mobility with the rate applicable per day for the receiving country concerned. Volunteer will receive – food allowance and pocket money. The volunteer has the right to receive support for local transportation: Team for Youth offers to reimburse the local transportation tickets (just for activity purposes) for bus or train, based on the receipt or tickets in original. The volunteer has the right to be hosted and directed in the local community from the arrival time: Team for Youth provides a tour of the city (in the first days of arrival) together with one local volunteer. The mentor will also take the responsibility of introducing the volunteer to the community. The volunteer has the right to have free accommodation. Our flats are rented flats and the volunteer will share the flat (sometimes the room) with other volunteers. The changing of the accommodation to another one is possible only in exceptional situations. The cleaning of the flats is the responsibility of the volunteers. The volunteer has the right to receive support in the activities: Team for Youth will be in charge of coordinating all activities of the volunteers. For events, seminars, language clubs we will promote it, find the location, and keep in contact with the participants, a task usually shared with the volunteer. For activities in schools or kindergartens, community centers or daycare centers, Team for Youth gets in contact with the teachers, provides the volunteer with all needed information, documents, makes the partnership with the school/ institutions. The needed materials will be provided by the office staff, as long as they keep the budget allocated through the project. Moreover, in the volunteers’ room, in the office, there will be a box of materials to be used in the activities (pens, markers, paper, etc.). Volunteers can take extra stuff for activities and free time provided that they complete and sign a ”burrowing sheet”. The volunteer has the right to two consecutive free days weekly and two days of holiday per month. The holidays must be requested from the hosting organization with at least one week notice. The volunteer cannot take more than one week off holiday and also cannot gather all holiday days for the end of the project or for one time only. – The volunteer has the responsibility to respect and take care of the accommodation provided. According to the rules of how to behave in the house. – The volunteer has the responsibility of respecting the work and background of the staff members and of the other volunteers and not act in a way that will offend or injure them. – The volunteer must attend all training sessions organized by the National Agency. – The volunteer must attend the regular meetings with the mentor and recognize him/her as the person responsible for their wellbeing in the host country. – The volunteer must respect the deadlines established by the hosting organization. – The volunteer has the responsibility to be in time in the activities. – The volunteer has the responsibility to announce, by themselves, an exceptional situation that keeps them away from the activities for a certain period of time. – The volunteer has the responsibility to attend all meetings organized by the hosting organization. – The volunteer must inform the hosting organization about any problems that come up during the activities. – The volunteer must attend all Romanian lesson in the first two months of project and, if decided to continue for the rest of the project, they have to attend every lesson for the next months of the project. – The volunteer must be included in a cleaning schedule in the office and take the responsibility of it. – The volunteer must annonce broken or missing things in the flats and take responsibility for their actions. – The volunteer has the responsibility to prepare their activities (posters, materials, descriptions, presentations, etc.) and to evaluate (evaluation forms, pictures, reports) together with the project coordinator. Partying or strong noise after 22:00 is not allowed. The owner of the flat and/or the staff of Team for Youth can decide to visit the volunteers flat at any time, announcing to the volunteers before. Conflicts between flatmates should be brought to the attention of the hosting organization, when the volunteers cannot manage to solve them between themselves or with the help of the mentors. Weekly cleaning is compulsory. We suggest to the volunteers to have a cleaning schedule with their flatmates. No pets (cats, dogs, insects, flying or swimming) are allowed. If there is something missing from the flat, it is volunteers responsibility to let the hosting organization know about it. At the end of the project the flat (or room, depending on the case) should be completely clean: beds, wardrobes, floors, kitchen, bathroom, bed sheets and towels. If this is not the case, Team for Youth will keep 50 RON from the volunteers pocket money, for the cleaning of the flat after departure of volunteers. The process of EVS in under 2 minutes! 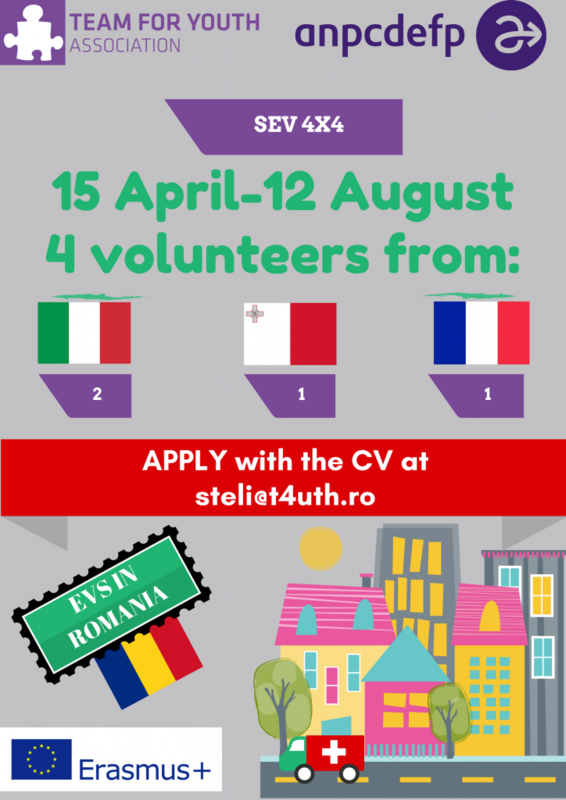 For applying to this project send an email (with CV) steli@t4uth.ro!